As Moses enters his last day of life at age 120, he is obedient to God and climbs a mountain. From there we are told, “God showed him the whole land”. Second, I was curious if the view from Mount Nebo matched the biblical account. There is a lot of guesswork in trying to identify any specific spot in the middle east. This writing took place long before accurate maps and there were no GPS coordinates provided. But, from my research, there appears to be fair agreement on the location of Mount Nebo. It is a mountain rising from Jordan’s plateau with a current height of 2230 ft above sea level, keeping in mind that the dead sea to its west is 1401 ft below sea level. A mountain range rises to the west of the Jordan river, blocking the due west view to the Mediterranian Sea, but there are sight lines not obscured by other mountains. We also don’t know the effects of erosion or other shifts in the landscape over the past thousands of years. But look again at the wording of this. He saw Dan, Naphtali, territory of Ephraim and Manasseh, the land of Judah. Keep in mind, that when Moses is called by God to look over all of this land, the Israelites have not yet crossed. They’ve taken a census, but they haven’t divided the land. The amount of land they possessed west of the Jordan, at this point, was zero. What God allowed Moses to see wasn’t just a bunch of dirt and rocks. It wasn’t the cities of enemies or the struggles and battles that lay before the Hebrew people. Instead God allowed Moses to see the land as it was promised and would be. 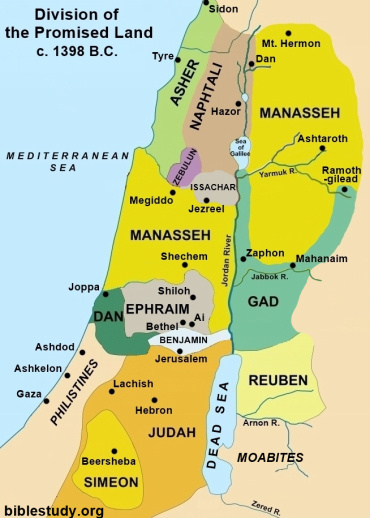 A land belonging to the tribes of Israel, rich with food and water and livestock and massive in its dimensions. He allowed him to see their earthly home. And then, as Moses was still being allowed to look through God’s eyes, he would have been allowed to see his own eternal home. The promised land for the Jews was a foreshadow of something bigger, better and everlasting. Open your heart and open your faith so that you can see. How do you need to ask the Lord to remove the blindness of your heart where your view is blocked by fear, doubt or disbelief. Covenant promise, unconditional, Forever, Everlasting possession, to Abraham and his offspring. The key is that while this covenant refers to a physical place, land that can be walked and measured by width and breadth, it also refers to something bigger and more significant and more eternal. If the land was all there was to the promise, it would not be forever or everlasting. The promise was not just of the physical space but in the spiritual realm, a promise of everlasting life and eternal communion with kinsman and the Lord. It was a foreshadowing of the promise of God to an everlasting home. Our eyes are not focused on where we stand, but where we are going. Where we stand, we are strangers and foreigners, but where we are going is a spiritual (and ultimately physical) forever. True greatness comes by serving the Lord, not by human strength. The Notes are Good Create a free website or blog at WordPress.com.